Guessing when the lights will change when sitting at a busy intersection will be a thing for the past. I too do not enjoy waiting at red traffic lights, exclusively when I don’t know how long it’ll take until I can get moving again. Hence the Ingolstadt-based carmaker wants to introduce some Audi models that will make it a little bit easier for drivers with the launch of a new traffic-light information system. Yes, your Audi will alert you about how long until the traffic light turns green. With the use of the car’s infotainment system, the Audi will use the built-in LTE data connection to download information about the status of traffic lights, and then shows a countdown timer on the instrument cluster or head-up display that indicates when a red traffic light will turn green. So … guessing when the lights will change when sitting at a busy intersection will be a thing for the past. As far as we know, the feature will only be available in Germany and some United States cities with ‘smart’ traffic lights. Sadly, the feature won’t be making its way to our shores, but then again, AudiSA confirms that it has plans for it probably in the next couple of years. 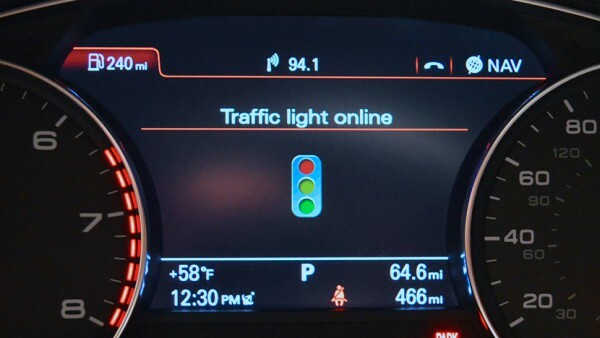 Traffic light information is the latest in a line of pioneering connected car innovations by Audi. In 2010, Audi was the first manufacturer to offer a broadband enabled vehicle. Since then, Audi connect® has continued to expanded on its industry-leading services and capabilities. In 2014, Audi was the first manufacture to offer 4G/LTE Broadband connectivity. Strategic partnerships and a proprietary scalable infotainment architecture has allowed Audi to continuously offer our customers the latest in mobile connectivity solutions.